Hoping this is the right forum to ask this in, If not, please redirect to the proper one. I've got a 15 year wedding anniversary coming up and would like to incorporate some 'Audio Swag' into my DIY gift for her. Having a 'mid modern century' stereo console built to house my soon to be restored Marantz 2230 along with my TT & vinyl. Thought the TT wall clock with a colored 'Elvis' record (her favorite) over the console would add a nice touch. I fully realize this may run completely against the grain of classic TT aficionado's & restorers but I'm looking for some model recommendations for this wall mount TT clock. Obviously would not want to cannibalize a rare, restorable classic but looking for a model with true visual character that might be readily available on the market. Have any of you done such a thing or have model recommendations. Appreciate any input. Bang & Olufsen tables come to mind. Great looking platters and mid-century aesthetics. They are plentiful and can be found cheap. May I ask for a little more information on true visual character? The better an idea "we" have of the visual vibe you seek, the easier it is to offer suggestions, I'd opine! 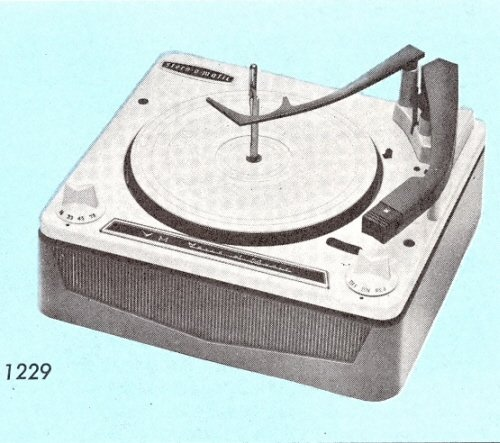 I mean, the above-mentioned b&o turntables were gorgeous works of art -- and pretty good tts as well (the 4004 is in the permanent collection at New York's MOMA), but they are from the 1970s and may not be the aesthetic you're looking for. The 1950s and 60s had their share of beautiful tts, although the aesthetics varied wildly -- and the prettiest of them all tend to be between very and obscenely expensive. All three of these Radio Shack changers are made by BSR. Garrard also made numerous cheap and forgettable changers fairly similar to the BSRs that also might be good options. A little earlier, the VM (The Voice of Music) changers of the 1950s included some attractive models (that were actually pretty good changers for their time!) that are fairly common. Not as cheap as the '70s BSRs, but the aesthetics are more "Happy Days", you know? Wow. Just wow. Those are nicer looking than anything I’d thought of. @mhardy6647 those BSR’s might be a bit ‘vanilla’ for this project. But certainly are from the right era. I’ve suddenly realized my wife’s mid century tastes and my contemporary / modernist tastes are slightly different. @nooshinjohn that one would be perfect. The nice thing about an RX-2 is that one with a bad cartridge should be pretty affordable. The b&o tts used a proprietary mount (and their cartridges were quite good! ), so it limits the value of the lower-end version (RX-2 was essentially their entry level) -- which is good for you. The RX-2 and its big sibling, the TX-2, were actually pretty good tts IMO. I have, and sometimes use, one of the latter, in fact. Not inexpensive, but quite good. Do you need more input on ideas or have you found the direction you want to go? I think that platter on the B&O lends itself well to being a clock face. Post pictures of it as you build it. Sounds like a very cool project. @nooshinjohn & @mhardy6647 As always, you both are a wealth of information on this subject as well as many other threads I’ve followed the two of you on. Had not even considered B&O TT’s. Love the simplistic look and will now persue them. Quick update. Found a TX2 w/ cartridge in the Seattle area for $75. Trying to get the seller to ship for full offer. Fingers crossed. Also realized that my 'significant other' would probably like a full wood plinth model like some of the Pioneers & Teac's. Probably cost prohibitive but would sure make some good looking wall art. Well, you might stumble into a wood-based beater cheap(ly) that could be cosmetically refreshed. Check fleamarkets, garage sales (maybe not the right time of year), charity sales, amateur radio swapmeets (it's that time of year, at least in northern New England -- we have several big ones coming up in the next few months), and even, yes, CL -- you might stumble across a bargain! The flush platter(s) of the b&o, though, may be the most practical to adapt for the desired application(?). Yes, after that suggestion, I can see the benefit of a lower profile table for this purpose. Hoping I could snag the TX-2 from Seattle but seller doesn't want to ship at this point. 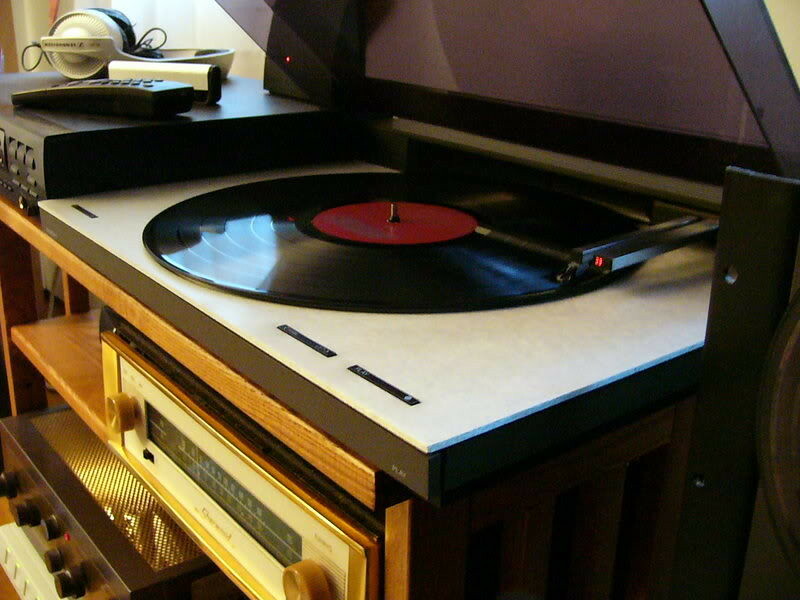 A nice Pioneer PL-550 or Teac TN-400s would also look nice hanging on the wall. Unless of course @mhardy6647 you decide to retire that 'old' TX-2 from your stable and allow me to repurpose it. LoL. Just curious, how long have you had it? ...Unless of course @mhardy6647 you decide to retire that 'old' TX-2 from your stable and allow me to repurpose it. LoL. Just curious, how long have you had it? I bought it at a charity fleamarket in Littleton, MA on a Saturday morning the day after our daughter's senior prom. That would make it May, 2002. I remember the day because we had snow that morning. 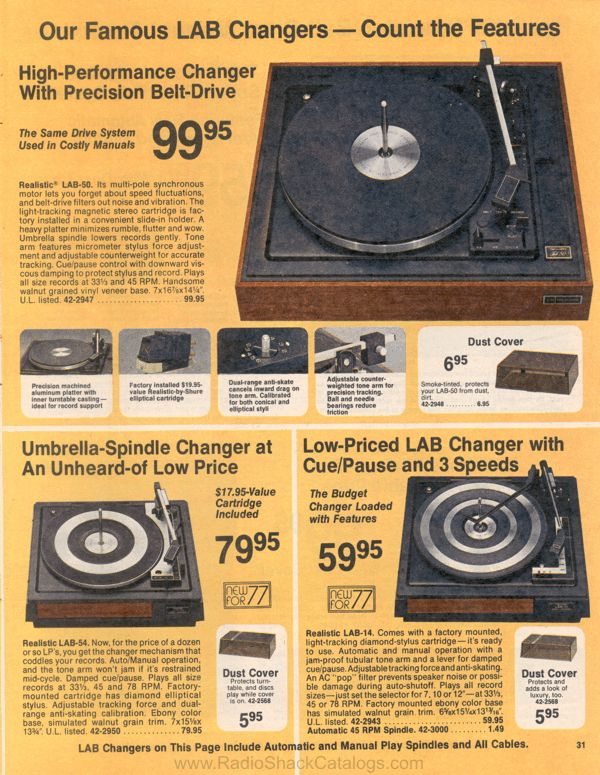 It was $10, with an MMC-3 cartridge with a borked cantilever. I bought an MMC-4 to replace it from the b&o store in Boston. They kindly shipped it to me, too! Probably one of the very last cartridges they sold. I was thinkin' about the other turning stock here, to see whether I had anything I could offer up/pass along... but I don't think I have anything here that'd float your aesthetic boat. meh, I'd hang it on the wall if I didn't like the way it sounds. For what I have invested in it, it sounds pretty good. It makes excellent backup! Forgive my delay in responding; Fairbanks is indeed far, but I’d like to help you out if I can, and if you’re still interested. 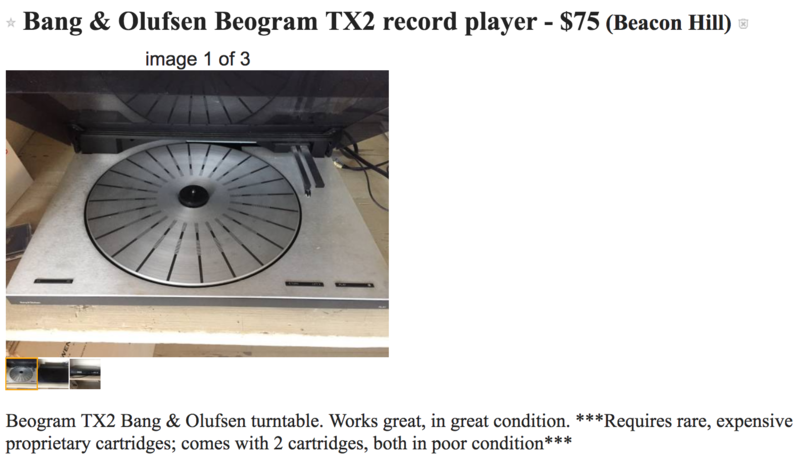 My dad (whose turntable this was) liked to restore old radios and often sought out parts from far flung areas, so it feels fitting to sell it to you. 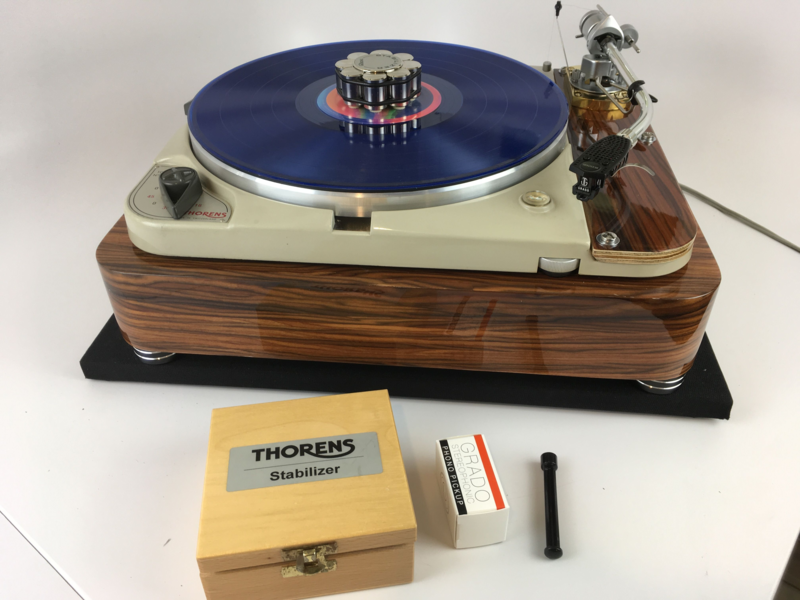 I’m a little nervous about sending something as sensitive as a turntable through the mail; I don’t think I can guarantee that it will be perfectly the same when it arrives, but perhaps if you are into restoration, you can deal with any tweaks it might need? My memory is that the manual has a few instructions for prepping it for transport; my plan will be to do those tasks, make sure the cartridges are snug in their cases (one has its b&o case, the other has a little padded plastic box), fill in bubble wrap under the turntable lid, surround the whole thing with bubble wrap and packing tape and seal it in a cardboard box with a couple inches of tightly packed scrunched-up paper on all sides. Let me know if you’d like a different packing method. Obviously, I'm committed to purchasing this TX-2 now. But, not sure I'll be able to re-purpose it for my DIY project. May keep just to restore. I am pretty sure there are lockdowns for transit. The manual (and the service manual) are available on www.vinylengine.com (IIRC). If you (the OP) would benefit from the docs, and if you're not a member there (and/or if you have trouble registering to D/L content from them), send me a private message and I can probably help you out. Soundsmith does sell replacement cartridges and they might even be able to retip the old cartridges. You could give 'em a call when and if the time comes. 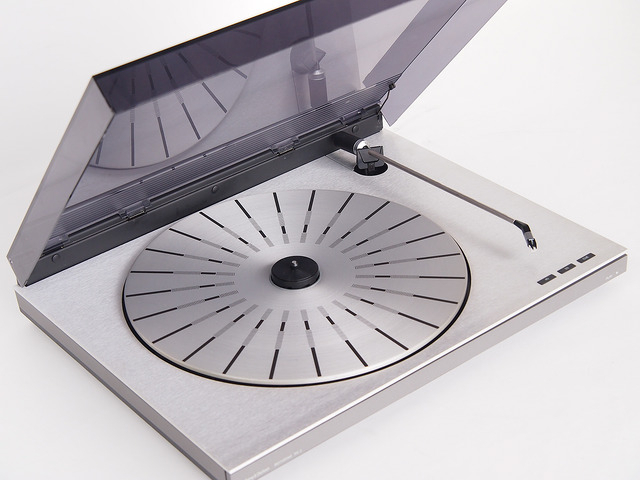 Why not procure an tonearm and platter, and DIY the base of it. Very cool idea, BTW. @steveinaz that’s not a bad idea 💡 I hadn’t thought of it.